BEACON Grant Program: Deadline Extended! BEACON has received overwhelming interest in our 2017-2018 Grant Program! In an effort to best support applicants, we will extend the deadline to July 31st, 2017. Those who have already applied will be able to edit their applications up until this date. 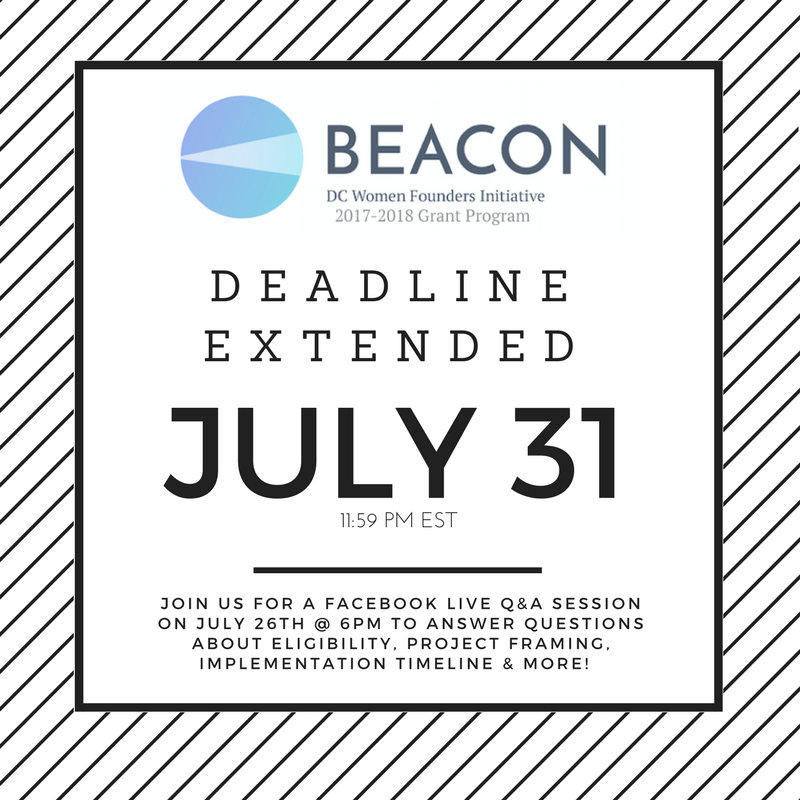 BEACON will also host a Facebook Live Q&A session on July 26th at 6pm to answer questions about eligibility, project framing, grant implementation timeline, and more! Be sure to follow us on Facebook to check it out! Applications close July 31st - Apply Today! Do you have an innovative and collaborative idea that supports women entrepreneurs in the District? It's not too late to apply for up to $10,000! BEACON was featured in one of Washington DC Economic Partnership's latest publications, "How Washington, DC is Diversifying the Tech Sector." Find out how city partners are working together to study and collaboratively solve issue of diversity and inclusion in our tech ecosystem. We've received overwhelming interest in our Grant Program and want to make sure to answer all of your questions! So, join us for a Facebook Live session featuring the BEACON Fellow. Feel free to submit questions live via comments, or email them ahead of time to thebeacondc@gmail.com. Interested in partnering with us or powering a head shoot both at your next event? Submit a Partnership Request Form and we'll be in touch! Distinctly Creative is an art collective + company whose mission is to give a diverse, holistic, and collaborative representation of the DC, Maryland and Virginia (DMV) creative scene - - and beyond, through a wide array of social and professional development opportunities. Distinctly Creative was founded by Morgan Davis, a Howard University graduate currently pursuing her MBA at the University of Maryland University College. The JumpFund invests in early-stage, women-led, high-growth ventures. Ongoing due date. Pipeline Angels seeks to change the face of angel investing and create capital for women and non-binary femme social entrepreneurs. The DC Fall Pitch summit will held on 10/12. Apply by 8/2. 37 Angels selects eight women-led businesses to compete for $50-$150k investment every two months. Know of opportunities that could benefit the BEACON community? Email thebeacondc@gmail.com to share! Do you have legal questions about patents, trademarks, copyrights or trade secrets? Do you know if your privacy policies and terms of service provide adequate protection? Are you sure your employment and partnership contracts are up to par? Whether you're a creative, tech or brick-and-mortar business, this workshop is for you! BEACON has partnered with Google and ChIPs to power a FREE, full-day legal workshop for women entrepreneurs. We hope you can join us! Register today! BUILD Metro DC is a four-year in-school and out-of-school time program that engages high school students from under-resourced communities through entrepreneurship training, and college and career readiness. Click here to learn more about BUILD's program. 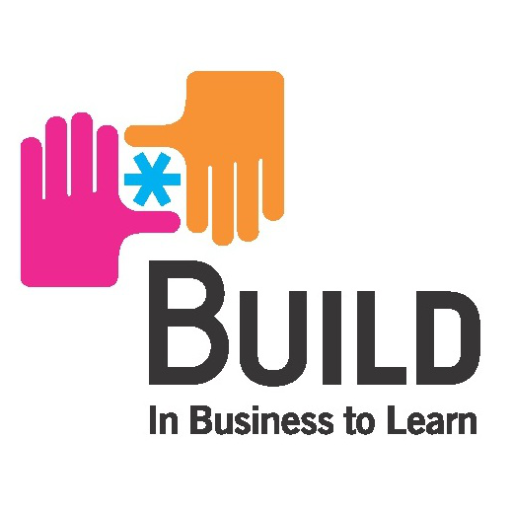 To support the mission, you can donate, mentor students, or volunteer at BUILD's next event, email builddcinfo@build.org.